Lake Solano is known as one of the best fly-fishing spots in the Sacramento Valley. Background: Putah Creek flows from Lake Berryessa into narrow Lake Solano, then meanders through Davis and flows into the Yolo Bypass. Creekside vegetation hums with the summer songs of western bluebirds, western meadowlarks, and cedar waxwings. The lake, rocky outcroppings, riparian vegetation, and oak woodlands are home to more than a dozen resident mammals, including beavers, minks, raccoons, and black-tailed deer. Quiet lake waters lure wintering ring-necked ducks, hooded mergansers, wood ducks, and Eurasion wigeons, a half-dozen fish species draw buffleheads, western grebes and lesser scaups. Other winter visitors include great blue herons, common snipes, band-tailed pigeons, and ospreys. 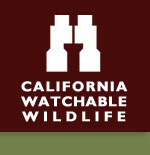 The grassy uplands offer excellent winter views of feral pigs, American kestrels, wild turkeys and California quail. The island attracts phainopeplas. Owned by the Bureau of Reclamation, Lake Solano is managed for public recreation by Solano County. The Experience: This site is of ecological value, because of the diversity of wildlife viewing within the riparian corridor. Wildlife and Where to Find It: Cars, boating, trails- both paved and unpaved. Viewing Tips: Best viewing early morning, late afternoon. Look for waterfowl from November to February. Songbirds are seen year-round, migrants stay from May to October. Birds of prey, deer, and small mammals are active year-round, look for beavers in spring. Good views from DFG fishing accesses on Putah Creek/Park. Good viewing of River Otters in Lake Solano, best in mornings. Hours: Campground varies, Day Use Area 8-5pm. Parking Notes: Pull offs along State Highway 128 and Putah Creek Road. How to Get There: West of Vacaville on Highway 80, take the Pena Adobe Road exit north to Pleasant Valley Road. Drive about 13 miles to lake.